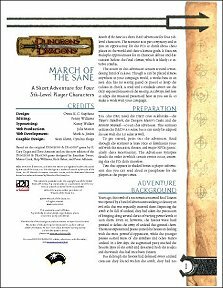 An adventure for 5th-level characters. Publisher's blurb: "Billing themselves as Places of Sanity, small towns all over the realm have begun turning away adventurers. All over the region, inns, taverns, shops, and even private homes have begun turning away adventurers. 'No heroes', say the signs on the doors. Shortly thereafter, these same towns are found razed to the ground - looted, burned, and empty of life. What evil is causing whole towns to forswear not only heroes, but also their normal defenses? Within the past few months, a new cult has been gathering momentum in the outlying areas of a civilized realm. Led by a man named Wautto, its members call themselves the Sane and forswear the use of violence in any form. A persuasive speaker, Wautto has gathered numerous followers while visiting small towns and preaching that violence is wrong and evil. But though such an attitude seems laudable, the cult members have used almost every form of coercion to rally others to their cause - including the violence they claim to abhor. "With the aid of his followers, Wautto has launched a campaign to convince townsfolk everywhere that in order to have peace, they must refuse to support those who resort to violence - even violence against evil. As soon as a town rallies behind this concept, Wautto declares it a Place of Sanity and moves on, leaving a few of his followers behind to watch over it. "One by one, however, Places of Sanity have fallen victim to bandit raids, assaults by orc tribes, and the predations of undead. Why have these places been targeted by the forces of evil? Is Wautto somehow involved in their demise? Only the PCs can put a stop to the deaths that follow in the wake of the Sane - and they're not welcome!"